Home » Posts Tagged "Nare-Zushi"
Sushi nare-zushi (??? ?, ???) is a Japanese food consisting of cooked vinegared rice (shari) combined with other ingredients (neta), usually raw fish or other seafood. 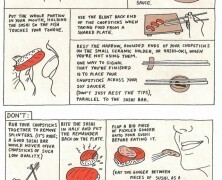 See the ways of “Do” and “Don’t” of a “correct” Sushi meal.